Sage Summit 2014 is a combined partner and customer event scheduled to be held July 28-31, 2014 in Las Vegas. Not much information has been officially released by Sage other than “Sage Summit will continue to provide opportunities to connect one on one with your customers, as well as attendees who are not yet part of the Sage family”. Early registration for customers featured a significantly reduced rate of $99 (expired 1/15/14). Sage indicates at least 1,000 customers took advantage of the promotion and that their goal for 2014 is to double attendance (which was likely in the 2,500-3,000 range for 2013 against a pre-event estimate of 3,500). We’ve receive numerous web and phone inquiries about this event and here is our unofficial shot at a frequently asked questions guide to Sage Summit 2014 in Vegas. 1. What is the cost for Sage Partners to attend? Through March 28, 2014 partners may pre-register at http://na.sage.com/us/sage-summit/info-request and use promo code PREPART to receive a reduced rate of $399. After March 28, 2014 the rate will be $799. Full registration is scheduled to begin in April 2014. We do not yet have an exact date when registration will open. 2. I’ve received phone calls from a number of companies offering to book my hotel for Sage Summit – is this legitimate? Quite a few Sage partners and exhibitors have been contacted by a company (or companies) claiming to represent Sage housing. 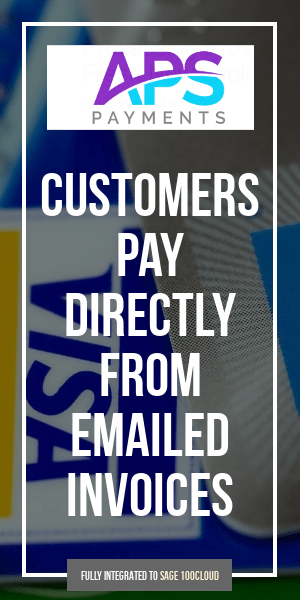 Whether these companies are misleading participants or simply aggressively marketing an independent travel service is open to interpretation. Sage says that these inquiries by third parties are a scam and that housing reservations made through unaffiliated third parties can’t be guaranteed and may have hidden charges. The official housing registration will be online and you can book in April 2014 when registration is scheduled to open. 3. When will exhibitor information be sent for Sage Summit 2014? As of March 3, 2014 it appears only some exhibitors have received information. As a 2013 sponsor/exhibitor, you will be the first to be notified. The prospectus will be available by March 17, and contracting for booth space and sponsorships will open on March 25. Registration for booth staff and hotel rooms will be available on April 8 when Sage Summit registration opens for everyone. As discussed on LinkedIn by a Sage representative – here are some major changes to this year’s program, where their goal is to add value and exposure to every exhibitor. • The new program is turnkey which means it is inclusive of physical booth properties, internet access, computer monitors, drayage, electrical and more. All you bring is staff and your demo device. The package last year only included the space and electrical. •More exhibit conference passes have been added to each package. The expo will be open all day, every day and are supporting your need for additional staff. • A “just one place” format that is open all day, all the time with learning centers, interactive theaters, hands on labs, solution centers and more. 4. What will the agenda look like for Summit 2014? forget everything you ever knew about Sage Summit, because this year’s conference is going to be like nothing you’ve ever seen before. The only thing you’ll recognize in Vegas will be the Sage green- everything else is going to be radically different. It seems likely that there will be more sessions covering general business topics of interest to the typical conference attendee. 5. 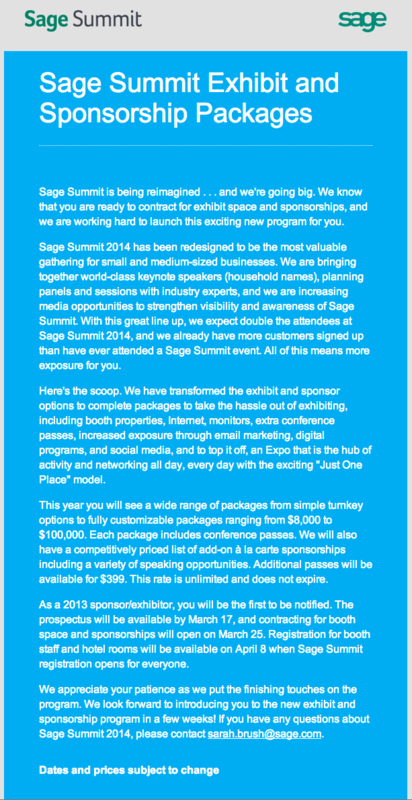 Will this year’s Sage Summit 2014 include meals, events, etc – even at the steeply discounted early registration rate? So far as we are aware events and meals are all included. However until registration goes live it won’t be possible to know for sure. This is the information we have as of now. As more details become available we will update the above.